Included in the price of the Forum Registration were a wide range of workshops on ecosystem services. These workshops provided a setting where courses were taught, and different communities came together to discuss technical topics and engage in an active exchange of ideas and expertise (e.g. professional development, education/skills focused, research topic focused, place-based studies). Workshops were run on Monday 27th and Tuesday 28th March 2017. Forum participants were encouraged to fill their agenda, and register for 1 workshop (see the list below) in each of the 6 ‘Workshop Sessions’ – view the Final Workshop Schedule here. Note however, many of the workshops ran across 2 or more Workshop Sessions (i.e. they were half day or full day workshops). All workshops were on Level 1 of the Novotel. Level 1 floor plan is here. Global efforts to stop biodiversity and ecosystem services erosion translate among other into a strengthened focus on the impact mitigation hierarchy (avoid, minimize, rehabilitate/restore, offset) as a coherent whole. A particular challenge pertains to developing and implementing robust biodiversity offsets policies. So far offsets in the Pacific have developed on a very ad hoc, project-by-project basis and without much exchange of experience in the region. This workshop will contribute filling this gap while allowing the Pacific region to take a more active part in a key global conservation debate. Forest ecosystem services are the direct and indirect contributions that forests make to economic prosperity, environmental conservation and human well-being. These services include the provision of timber, climate regulation, biodiversity conservation, recreation, cleaner air and improved water quality. Accounting for ecosystem service indicators and values helps forests to be better represented in the landscape resulting in more informed policy and decision making for creating healthier ecosystems that contribute to improved community resilience. ‘Biophilic Design Elements’ are natural elements used purposefully as design features within urban landscapes. The objective of this workshop is to engage with the community to conduct an ecosystem service assessment of Biophilic Design Elements using a participatory process to show the potential each of these Biophilic Design Elements possess to provide ecosystem services. The workshop will demonstrate how ecosystem service concepts can find cross-disciplinary application, fostering dialogue and knowledge sharing between architects, urban designers, landscape architects, building designers, ecologists, environmental ethicists, ecological economists and ecosystem service experts and showing how Biophilic Design Elements maybe an appropriate measure against climate change. Workshop Output/Outcome: Participants worked together in teams in an interactive and collaborative session. The objective was to assess Biophilic Design Elements on an ecosystem services ‘scale’ provided by documentation from the existing South East Queensland Ecosystems Services Framework (SEQESF). The data collected through this round of expert engagement is going to be collated to develop information for stakeholders who recurrently participate in building and urban development activity in order to enlarge their knowledge on how Biophilic Design Elements can be used to provide ecosystem services in intensely urban situations. This 3 hour workshop provides an introduction to the essential components of ecosystem accounting following the international guidelines of the System of Environmental-Economic Accounting (SEEA). Ecosystem accounting is a rapidly growing field of measurement and official statistics with testing and implementation underway in many countries, localities, and emerging work at a corporate level. Participants will learn about the rationale for ecosystem accounting and its spatial approach to measurement; the core framework encompassing measurement of ecosystem extent, condition, services and benefits; and the potential applications of ecosystem accounting at micro and macro scales. The workshop will be led by Mark Eigenraam and Carl Obst, two of the world’s leading experts in ecosystem accounting and will involve presentations, group discussions and accounting exercises all aimed at providing a comprehensive introduction to this exciting and important area of work. Water has spiritual and cultural connections for indigenous peoples. This session is an interactive opportunity for indigenous peoples to talk about their spiritual and cultural connections to water. The relationship of these spiritual connections to land and ocean conservation, management and restoration will be discussed. Indigenous people’s needs to address this topic into the future by the IUCN CEM Ecosystems and Invasive Species Thematic Group will be established through a network of indigenous people interested in the ongoing development of collaborative projects incorporating indigenous perspectives. The workshop aims to engage research and policy institutions in Oceania working in areas closely related to natural capital accounting. It will address the opportunities and challenges related to the production and use of natural capital accounts in the region, and discuss the value proposition of a research and practice network to catalyze efforts on the topic . The workshop aims to host a seminal exchange and networking event with the goal to design some of the core features and founding actors of such a network, identify a work program with different streams of possible activities, and to provide a physical platform for networking amongst early takers. The workshop is addressed at individuals as much as at institutions with experience on ecosystems and their valuation, from an academic or policy perspective, or a strong interest in building a work program on the topic. Workshop Output/Outcome: Following up the meeting in March 27th in Brisbane of 28 representatives from different agencies from the Pacific region, GDN developed an online platform, the Pacific Natural Capital Accounting Network – PANCAnet (www.pancanet.org), designed to serve as a virtual working space for network members. It is organized around discussion topics: ideas on how to link the production and use of natural capital accounts that members would like to see become funding proposals and projects within the next few months. Members include researchers, policy makers, national and international civil servant and NGO representatives – and anyone interested in using natural capital accounting to inform progress and development in the Pacific region. The outcomes of the workshop, including the presentations, are available on PANCAnet. Pacific island countries and territories rely strongly on coastal ecosystem services and natural resources to support national economies and community livelihoods. However only a limited number are explicitly addressing ecosystem approaches as part of climate change adaptation programmes. 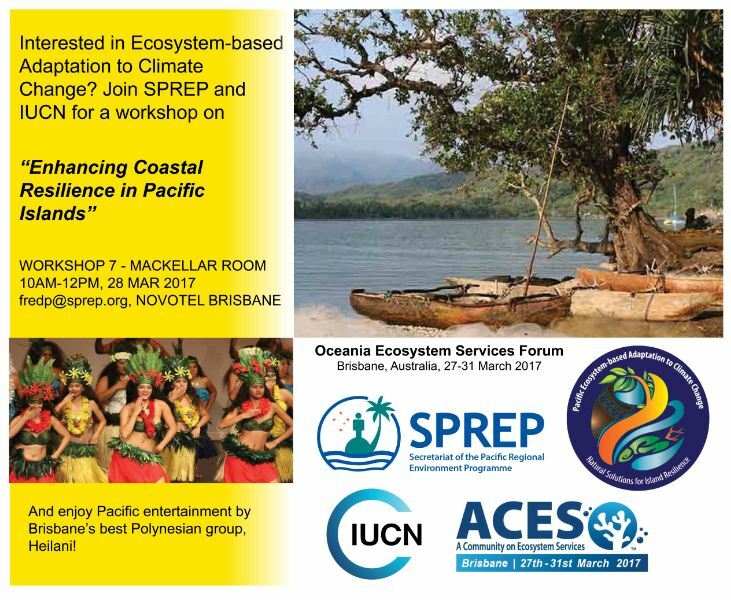 The workshop will present a conceptual programmatic framework for assessing coastal ecosystem services as a basis for building long term resilience to climate change impacts in a Pacific island context. The workshop is targeted at planners, policy makers, and development professionals. The aim of this workshop was to explore and evaluate each and every link between Ecosystem Services (ES) and natural resources from Indigenous perspectives, including main provisioning, socio-cultural as recognised by the participants, and regulating ES, that can help to develop an Indigenous specific ES framework. The facilitator(s) used the commonly used ES frameworks developed by the Millennium Assessment (MA 2005) and the Intergovernmental Platform on Biodiversity and Ecosystem Services (IPBES 2015) to start topic discussions. The focus was on ideas linking spiritual and cultural values of natural systems with people’s wellbeing. The workshop explored the policy mechanisms that can help mainstreaming ES for Indigenous development (wellbeing), applying integrated, multi-disciplinary approaches. Workshop Output/Outcome: we target to develop an Indigenous/local communities ecosystem services framework, and to publish that as a journal article. An initial outline of the paper was drafted. W9 – Workshop 9: The Natural Capital Protocol – what is it and how will it help my business? Too often natural services have been taken for granted and considered free by business, government and the general community. We now face a depleting stock of natural assets and are in danger of degrading our world’s natural capital beyond repair. If society is to thrive and grow, sustainability needs to be woven into the very fabric of our economy, meaning that natural capital needs to become a part of everyday business decision making. In response, the Natural Capital Protocol was developed, offering a standardized framework for business to identify, measure and value its impacts and dependencies on natural capital. Join us to learn how the Protocol was developed, why it’s relevant to your enterprise and how it can help you make better decisions. This workshop is part of the business stream. This workshop was focused on developing the understanding of trade-offs and synergies among ecosystem services (using the South Asian region as a case study) to maximize the benefits for human wellbeing and biodiversity conservation. The workshop provided an opportunity for those interested in contributing to biodiversity conservation and incorporating ecosystem service trade-off and synergies into decision making to have an open and creative conversation on, share ideas and gain a deeper understanding of the different issues related to socio-ecological scenarios, community livelihoods and decentralized management of natural resource management. 1/ Read the workshop Summary Report here.